Buy your tickets now. Here. Traditionally, I am not a fan of Sweeney Todd - so much so that I passed up the opportunity to see this show on Broadway, starring Michael Cerveris and Patti LuPone. 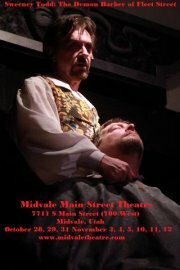 However, Midvale Main Street Theatre's current production had me enthralled from start to finish. Sweeney Todd, in a nutshell, is a show about a barber who returns to his home town to seek revenge for horrible misgivings thrust upon him. He takes up shop above a destitute bakery, run by Nellie Lovett - a woman who has been infatuated with him for years. Through a twist of events, he and the widow Lovett become accomplices in a murderous meat pie venture, hence the monicker, "The Demon Barber of Fleet Street." A single spotlight is eerily placed upon a performer dressed sickeningly drab from head to toe. He raises his head, gives the audience a glazed over sneer of a look and let's his voice boom out, "Attend the tale of Sweeney Todd." And so begins a performance that attend you must. Sweeney Todd, as played by Jim Dale, is incredible. The look Jim carries in his eye is hollow, longing, desperate, the kind of look you see in a man trying to fill a bottomless void in his soul. And his voice - his voice! You will not find many like this in community theater, especially not for the price of these tickets. Jim's tone is one of those that resonates deep into your chest, which made his performance all the more piercing for me, as I could feel everything he conveyed through the music. Eve Speer as Mrs. Lovett will have you in stitches the entire evening. I often found myself wondering, "How can I love a woman who is cooking people into meat pies?" But you love her and look forward to every moment she is on stage. With such a dark premise, her character and Speer's interpretation of the character are welcome and much-needed relief. Speer was previously seen as Sylvia in Midvale Main Street's production of All Shook Up, and she was fantastic, but her performance in Sweeney Todd is exponentially everything more, being the pinnacle of a showcase for her talents. Thanks to Kathryn Smith, as Tobias Ragg, the song, "Pirelli's Miracle Elixir," has been constantly looping through my brain for two days now. Kathryn, I heard rumor, is a 19-year old young lady perfectly playing the part of a 12-year old boy. You have to see her to believe it. Her energy, speed, preciseness, naivete, and movements are spot on for this character. You actually sit in the audience and wonder how such a small venue was lucky enough to find such a true fit for the role. The last stand-out performer I will mention is Russ McBride, as Judge Turpin. Blair Howell, for the Deseret News, stated, "The production is at its zenith when Todd duets with his nemesis, Judge Turpin (a splendid Russ McBride), in a nice-sounding, well-performed 'Pretty Women. '” I couldn't agree more. The melody was haunting as Turpin pleasantly, playfully hums. Each cheery note is haunting as the audience realizes what is about to happen. McBride captures the essence of Judge Turpin as a schmoozing political figure - at once captivating to an adoring public, whilst a terror behind closed doors. Typically you will see over-the-top costuming and bizarre set pieces in productions of Sweeney. Midvale took a different twist with the design of costuming, make-up, and set pieces as realistically drab, which I loved (with the exception of a truly hideous, utterly entirely distracting blonde wig on what is supposed to be the most beautiful character in the show). This more realistic approach feeds into the urban legend that this tale is based upon actual events - you believe something like this could actually have happened. At least for the duration of the show, you find yourself believing, almost hoping it did because it makes you that much more terrified. Rotating set pieces are often a treasure left on the stages of the more professional venues, but I was delighted with what this production shares with us. Scene transitions were practically flawless, as the set rotated to the next location instead of black outs and characters carrying on and off clunky set pieces. The real treat happens when Todd gets a little more creative about his disposal of his victims (go see the show to find out). Lest you feel bamboozled if you see the show and you do see an error, I will let you know that mistakes do happen. A few of the high soprano notes are not reached although attempted, a few of the male soloists squeak, one of the performers has a microphone that doesn't like him, one of the performers has some issues with deciding whether to look at the scene partner or the audience, one character needs to enunciate her words more, and there are your general little faux pas here and there. But overall? I did not feel this detracted from the quality of the show. Perhaps I am so lavish with praise because I did not expect to enjoy the show much at all, let alone have the desire to go back and the inability to stop humming the Sondheim tunes. Have I mentioned I don't care for much Sondheim? Yes, I do tend to sugar-coat my writings about shows - sandwiching the sour pickles in between juicy hamburgers - but this show truly is delicious. Another fair warning, the show is PG-13 because of violence, a dark theme, and a few four-letter words. If you want a big, bright, spectacle of a family-friendly show, this is not for you one bit, but if you are looking for a unique, diverse theater experience, you can't miss this. You only have three opportunities remaining to catch Sweeney Todd and, if I were you, I'd take up one of those opportunities. Tickets are $10 for November 10, 11, and 12 at 7pm at the Midvale Main Street Theatre - 7711 S. Main Street. You can buy tickets online, at the door, or call the box office at 801-566-0596. Thanks Larissa! This is a great review! I am so glad you came to the show! And thanks Aaron for showing me this. Thank YOU for being such wonderful performers! I've definitely been talking up your show to everyone who asks. Congratulations on a job very well done! Break a leg this closing weekend! Reading my blog? Click "Follow" to keep up!